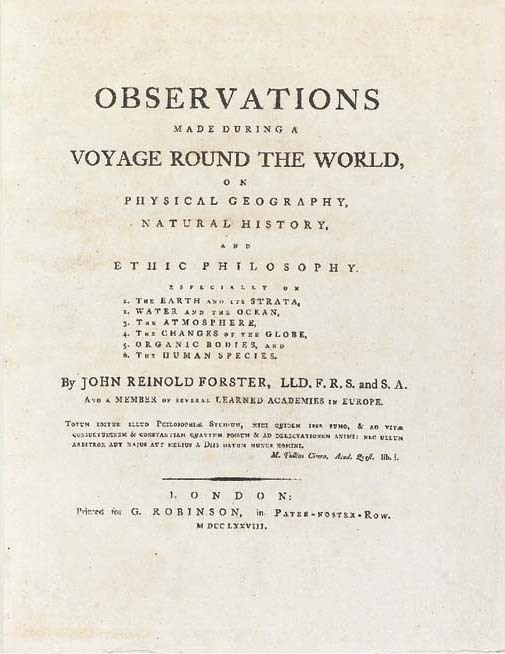 Observations made during a voyage round the world, on physical geography, natural history, and ethic philosophy. London: for G.Robinson, 1778. 4° (289 x 228mm). 1p. errata, 1p. subscribers' list. 1 folding engraved chart, 1 folding letterpress table. Contemporary speckled calf (expertly rebacked to style). Provenance: Earl Fitzwilliam (Milton [Hall,] Peterborough, [Northamptonshire] book-label). THE FITZWILLIAM COPY OF THE FIRST EDITION OF AN 'EXCESSIVLY RARE BOOK' (Wood) based on the author's experiences during Captain James Cook's second voyage. The work includes numerous fascinating observations including a lengthy section on 'Ice and its formation' (pp.69-102), remarks on South Georgia and 'On the Question concerning the Existence of a Southern Land': the expedition was the first to cross the Antarctic Circle, and Forster appears to have been in broad agreement with Cook that there was no 'great Southern continent'. 'Forster accompanied Cook as naturalist on his second voyage. An account is given of the countries visited in 1772-75, but for the most part this work concerns the South Sea Islands... their populations, food, cannibalism, the status of women, customs, languages, and mythology. The last section presents a detailed evaluation of the the steps taken for the preservation of health on the voyage, notably the suggestions of James Lind. Forster deals at considerable length with the health and diseases of the South Sea Islanders. He discusses venereal disease on several pages and suggests that it was endemic in the Islands, thus removing the reproach that it was introduced by the crews of Bougainville, Byron, and Wallis' (Hill). Conrad p.12; Hill I, p.109; Mitchell Cook 1262; Spence 467; Wood 346.